Dhaka – The Burmese military summarily executed several dozen Rohingya Muslims in Maung Nu village in Burma’s Rakhine State on August 27, 2017, Human Rights Watch said today. Witnesses said that Burmese soldiers had beaten, sexually assaulted, stabbed, and shot villagers who had gathered for safety in a residential compound, two days after Rohingya militants attacked a local security outpost and military base. Human Rights Watch has not been able to verify estimates of the number of villagers killed. Satellite imagery analyzed by Human Rights Watch shows the near total destruction of the villages of Maung Nu (known locally as Monu Para) and nearby Hpaung Taw Pyin (known locally as Pondu Para). The damage signatures are consistent with fire. On September 28, the United Nations Security Council met to discuss Burma publicly for the first time in eight years, but took no action. Human Rights Watch repeated its call for the council and concerned countries to adopt an arms embargo and individual sanctions, including travel bans and asset freezes, against Burmese military commanders implicated in abuses. Human Rights Watch spoke with 14 survivors and witnesses from Maung Nu and surrounding villages in the Chin Tha Mar village tract of Buthidaung Township. The witnesses, now refugees in Bangladesh, said that after the militant attacks they feared Burmese military retaliation. Several hundred gathered in a large residential compound in Maung Nu. Several Burmese soldiers entered the compound while others surrounded it. 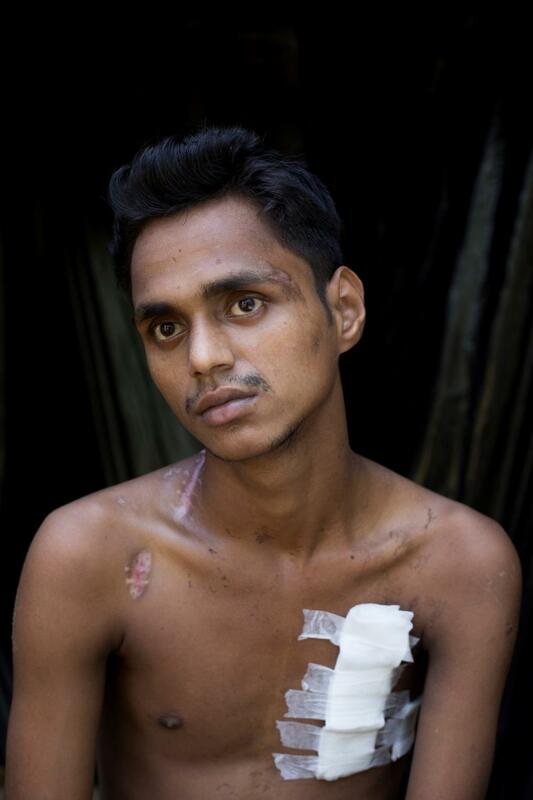 They took several dozen Rohingya men and boys into the courtyard and then shot or stabbed them to death. Others were killed as they tried to flee. The soldiers then loaded the bodies – some witnesses said a hundred or more – into military trucks and took them away. 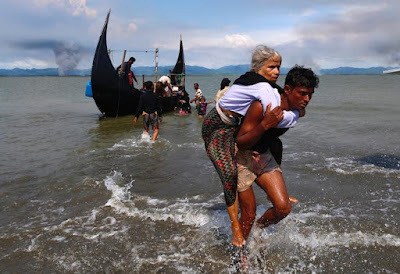 Over 500,000 Rohingya Muslims have fled to Bangladesh to escape mass atrocities by Burmese security forces. The crackdown followed after militants from the Arakan Rohingya Salvation Army (ARSA), on August 25, attacked a military camp and about 30 security force outposts throughout northern Rakhine State. The government reported that the militants killed 11 security force personnel during the attacks. The militants attacked the headquarters of the Western Command’s Light Infantry Battalion 552 in Taung Bazar, about 10 kilometers north of Maung Nu. The government said that at least 10 militants were killed. One of the post attacks occurred early that morning close to the market in Hpaung Taw Pyin, just north of Maung Nu, when ARSA militants attacked a checkpoint manned by the Border Guard Police (BGP). Residents living near the market told Human Rights Watch that they were sleeping at home and heard heavy gunfire coming from the area near the BGP checkpoint. They said gunfire continued until about 6 a.m.
Mohammad Usman, a 15-year-old Rohingya, said he was awakened by the heavy gunfire. When their homes caught fire, he and other villagers fled, but it was too dark to see who was shooting. “We ran out of our house to other villages,” he said. “Bullets were falling like rain and people were falling down around me. Suddenly, I felt something hit my arm and then my back. I lost consciousness and I woke up in someone else’s home.” Mohammad said he had been shot in the arm and hit by shrapnel in the back. The Burmese government reported that over 100 militants took part in that attack using “swords, firearms and bombs,” and that two police officers and two militants were killed. There are numerous reports of serious abuses committed by ARSA militants, though Human Rights Watch has not been able to independently verify those accounts, in part because of the lack of access to northern Rakhine State. Human Rights Watch could not verify the government’s figures, but witnesses said that after the fighting ceased soldiers from the army camp requisitioned a large private boat onto which they loaded an unknown number of bodies from near the village marketplace. The boat owner, Mohammad Zubair, identified the soldier who seized the boat as Staff Sergeant Baju from an army camp just south of the market occupied by Light Infantry Battalion 564. Zubair said he watched the soldiers load the bodies, some of which he recognized as young Rohingya men from the area. Witnesses told Human Rights Watch that after the militant attacks, several hundred frightened Rohingya villagers from the surrounding area fled to the compound of Badrudduza and Zahid Hossain, two well-off men in Maung Nu village, seeking safety and shelter. The large property is less than 200 meters from the main road that runs in a north-south direction through Buthidaung Township. Within the compound were a large two-story, mud-walled structure, several smaller buildings, and a large rectangular pond. Most of the men sought shelter upstairs while the women and most of the younger children crowded onto the ground floor. The witnesses said they gathered together hoping there would be safety in numbers. Witnesses said about two dozen Burmese soldiers arrived at the crowded property late in the morning on August 27. One soldier, identified by many witnesses as Staff Sergeant Baju, led several soldiers into the courtyard and began calling to the people hiding in the house in the Rohingya language. Villagers said Baju had lived at the nearby military base for 15 years and spoke Rohingya. Several overheard Baju trying to convince the men and boys inside the house that they would not be killed if they left the buildings. Villagers inside the courtyard as well as some who managed to escape and were observing from hillsides overlooking the compound, said that soldiers brought Rohingya men and boys into the courtyard. The soldiers bound their hands behind their back. Then they beat them, stabbed and slashed them with long knives, and shot them. Muhamedul showed Human Rights Watch his bullet wounds. He said that in addition to the two executed beside him, nearly 30 more male relatives were killed that day. 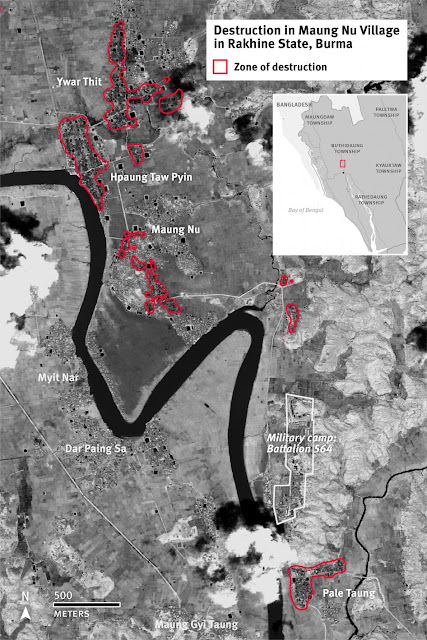 Human Rights Watch received credible reports that soldiers subjected women to invasive body searches, non-consensual touching, and sexual assault at the compound in Maung Nu. Witnesses said they fled the village when the military left the area. Many spent weeks trying to reach the Bangladesh border, where they crossed with thousands of other Rohingya. In March, the UN Human Rights Council agreed to send a fact-finding mission of international experts to investigate the abuses, but the Burmese government said it would not allow the investigators to enter.